Couldn’t agree more. 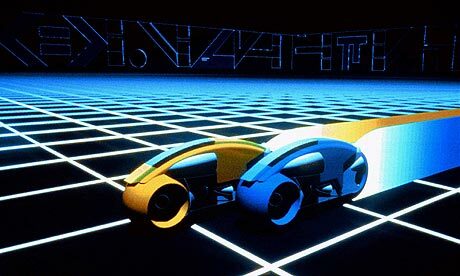 I think Tron: Legacy looks really awesome, but the first one is horribly dated. I think it was on the Frankly, My Dear podcast where they talked about how Disney is intentionally pulling the orignal Tron from DVD stores so younger people aren’t put off the sequel. I really hated this one. The story was awful, the SFX too unreal, the CGI on Jeff Bridges’ face is still a few years away from working the way it should. Sorry to say, I was even bored. Interesting point that the upcoming Tron Legacy could really negatively affect Hollywood if it bombs at the box office. I think it is the opposite though: If it does well, we will have even more expensive empty brainless movies so I’d rather this bomb badly and affects how Hollywood does things. Admittedly, I’m a casual fan of the original. Yeah, it’s dated, but the visuals are kind of engrossing and dynamic for their time. And I cannot freaking wait for the second one, sue me.